This 3D simulation of the Chelyabinsk meteor explosion of Feb. 15, 2013 by Mark Boslough was rendered by Brad Carvey using the CTH code on Sandia National Laboratories' Red Sky supercomputer. Andrea Carvey composited wireframe tail. The risk of asteroid impacts like the meteor explosion that devastated a Russian city earlier this year may be 10 times greater than previously thought, several new studies on the meteor's origin and power reveal. The meteor explosion over Chelyabinsk, Russia, on Feb. 15 was the first video-recorded meteor known to cause substantial damage and injuries. It was the largest airburst on the planet since the famed Tunguska event in 1908, also in Russia. Divers recovered a coffee-table-size chunk of the Chelyabinsk meteoriteweighing about 1,430 pounds (650 kilograms), the largest fragment unearthed yet, from the bottom of Russia's Lake Chebarkul on Oct. 16. Satellites also watched it streak through the atmosphere. "It was amazing to see the damage done by an asteroid impact firsthand," said Peter Jenniskens, a meteor astronomer at NASA's Ames Research Center and the SETI Institute, and co-author of one study on the Chelyabinsk event detailed online Nov. 7 in the journal Science. "You could tell it really made a deep impression on people there." Several studies of the Russian meteor explosion are detailed in separate editions of Science and the journal Nature this week. The airburst produced a shockwave powerful enough to knock people in its path off their feet. In Chelyabinsk itself, more than 3,600 apartment buildings had shattered windows , and the event sent more than 1,200 people in the region to hospitals that day. All in all, the shockwave caused damage to areas about 55 miles (90 kilometers) on either side of the meteor's path. "If humanity does not want to go the way of the dinosaurs, we need to study an event like this in detail," Qing-Zhu Yin at the University of California, Davis, a study co-author of a paper on the Chelyabinsk event detailed online Nov. 7 in the journal Science, said in a statement. The scientists estimate the total energy of the event was equivalent to an explosion of about 500 kilotons of TNT. In comparison, the atomic bombs that destroyed Hiroshima and Nagasaki each had the explosive power of only about 16 kilotons of TNT. One of the villages in the wider area around Chelyabinsk visited during the field survey. Image released Nov. 6, 2013. At peak brightness, the fireball appeared to be 30 times brighter than the sun. Of more than 1,000 people surveyed over the Internet, 25 reported sunburns from the meteor, 315 felt hot, and 415 warm. In Korkino, 18 miles (30 km) from the point of peak brightness, one person reported skin flaking off after a mild sunburn — ultraviolet rays from the fireball bouncing off snow on the ground may have intensified its effects on people. The arrival times of secondary sonic booms heard on the videos helped researchers locate when and where the asteroid fragmented in the sky. They calculate that the asteroid disrupted into 20 larger boulders between 18 and 28 miles (30 and 45 km) above the ground, which then went on to shatter into even smaller pieces at about 15 miles (25 km) altitude. Peter Jenniskens (left) and pilot Eduard Kalinin during an aerial inspection of the fall area. Image released Nov. 6, 2013. Investigators estimated the Chelyabinsk asteroid weighed about 13,200 tons (12,000 metric tons) and was about 62 feet (19 meters) wide, although it left a hole just 23 feet (7 m) wide in the ice where it landed. Based on analyses of the meteorite's composition, the researchers suggest the Chelyabinsk rock was the most common type of meteorite, an LL chondrite, the same as the space asteroid Itokawa, from which the Japanese asteroid probe Hayabusa collected samples a few years ago. The scientists estimated the Chelyabinsk asteroid was about 4.45 billion years old. About three-quarters of the meteoroid evaporated at the brightest and hottest point of its descent, and most of the rest converted to dust, researchers said. Only a small fraction — 8,800 to 13,200 pounds (4,000 to 6,000 kg), or less than 0.05 percent — fell to the ground as meteorites, significantly less than expected. The investigators suggest the asteroid may have been weakened by abundant "shock veins" riddling the rock, lines of iron grains caused by an impact maybe 4.56 billion years ago. "It deposited much less material than expected," Jenniskens told SPACE.com. "That's similar to what was seen with Tunguska, where nothing from the impactor survived." Jenniskens calculated the Chelyabinsk object may have come from the Flora asteroid family in the inner asteroid belt. However, the chunk that hit Chelyabinsk may not have shattered in the asteroid belt itself. Analysis of the rock suggests it was apparently exposed to cosmic rays for only about 1.2 million years, unusually short for rocks originating in the Flora family. Jenniskens speculates the Chelyabinsk rock belonged to a larger "rubble pile" asteroid that broke apart 1.2 million years ago, possibly after a close encounter with Earth's gravitational pull. Fragments of Chelyabinsk (C2 - C6) analyzed in this study. Find locations are marked. C2 is an oriented meteorite; it travelled with its flat side forward. Its backside is shown. Image released Nov. 6, 2013. Based on their analysis of the Chelyabinsk meteor, the scientists predict the number of asteroids 33 to 165 feet (10 to 50 m) wide that might impact Earth may be 10 times greater than thought. 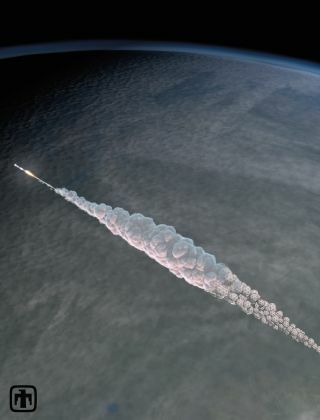 They performed a global survey of airbursts of a kiloton or more and found that standard models suggest only a 13 percent chance than any random 20-year period would have an airburst as large, or larger, than Chelyabinsk. Although the Chelyabinsk event might just be dismissed as a statistical fluke based on those findings alone, the researchers also noted a 1,500-kiloton airburst probably happened in 1963, and the 3,000-to-15,000-kiloton Tunguska event happened in 1908, and that the number of these large events suggest objects of this size might hit Earth more often than currently estimated. "There may be more tens-of-meter-sized objects that might impact Earth than telescopic observations have suggested,"study author Peter Brown, a planetary scientist at the University of Western Ontario and lead author of one of two studies on the meteor appearing online today (Nov. 6) in the journal Nature,told SPACE.com. Jenniskens said the event that created the Chelyabinsk asteroid may have generated rubble that also could still hit Earth. This might explain why the risk of similarly large rocks striking the planet is greater than currently modeled. "The Chelyabinsk asteroid was too small to be detected from Earth, and there are millions of asteroids of this size which are unknown," Jirí Borovicka, an astronomer at the Academy of Sciences of the Czech Republic in Ondrejov and lead author of one of two studies on the meteor appearing online today in the journal Nature, told SPACE.com. "Another body of this size could hit Earth without warning in the future. Fortunately, these bodies do not cause big disasters — it's only local damage, and it's likely that the next impact will be over an unpopulated region of the globe." "There are no globally devastating impacts likely to happen in the next 100 years, but things like Chelyabinsk are more common, and we might want to look at how to deal with things like it," Brown added. "Trying to survey every 20-meter-sized (65-feet) object is not practical, since there are millions of them, but a system to detect them in their terminal phase days to weeks before they hit may be more practical. We won't be able to change their course, but we can provide data on where it will probably impact to inform national rescue authorities and put out notices for evacuations."